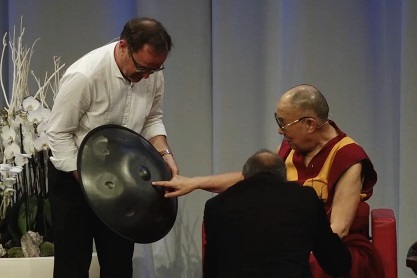 As a point of note, over at Facebook - HangBlog author Micheal Paschko has stated that despite the Handpan in question being presented to his Holiness the Dalai Lama as being a Bern made Hang, in the very birthplace of the instrument, “I have discussed this with Felix (one of the Hang-makers) and Frank (admin of the now defunct Hang-forum) and we are sure: This is not a Hang. Our best guess is: A BElls from Bellart. But I'm not completely sure. Perhaps a handpan from another maker.”. Which is a little strange. But regardless of the make, HDL seemed to be visibly impressed with the Handpan, just as he was with the Steel Tongue Drum before it, and so for that, we’re chalking him up as yet another fan of the instrument-type, and (however briefly) member of the Handpan-playing community.